TRAINING IS CANCELLED FOR ALL SQUADS ON EASTER SUNDAY AND EASTER MONDAY! Tuesday 23rd April: Training is back to normal for all squads: NSS, NJS, AG1&2, Dev1,2 & 3 and & Club Training. Please note ⚠️Aquasprints ⚠️Thursday 25th CANCELLED. Sunday 7th April saw one of the biggest single day swim meets held in Ulster in some years. Almost 700 swimmers competed in the Aurora complex in one day. Massive credit to Bangor and their team in hosting this event and allowing it to run so smoothly. Lisburn SC had 14 swimmers take part in the minor meet in the morning session in Bangor’s 7 lane 25 meter pool. The young team produced some terrific performances and improved skills throughout the morning. Team spirit was fantastic and swimmers took on board post-race feedback really well. In the afternoon session 42 swimmers arrived for some fast racing, after finding a spot in the gallery to accommodate us all we got down to the business of doing the processes we do every session at the pool, including pre-pool warms, pre warm up briefs, pool warm ups and then in to pre-race instructions and post-race feedback. The swimmers completely embraced these and all the processes enabled them to compete exceptionally well throughout the afternoon and evening. This was one the longest sessions of competition for a number of years, from first warm up to final swim over 6.5 hours in total and swimmers rose to the challenge and gain valuable experience from it. Sitting together (slightly) separated from their parents, learning to administer themselves and take care of their kit and keeping hydrated. 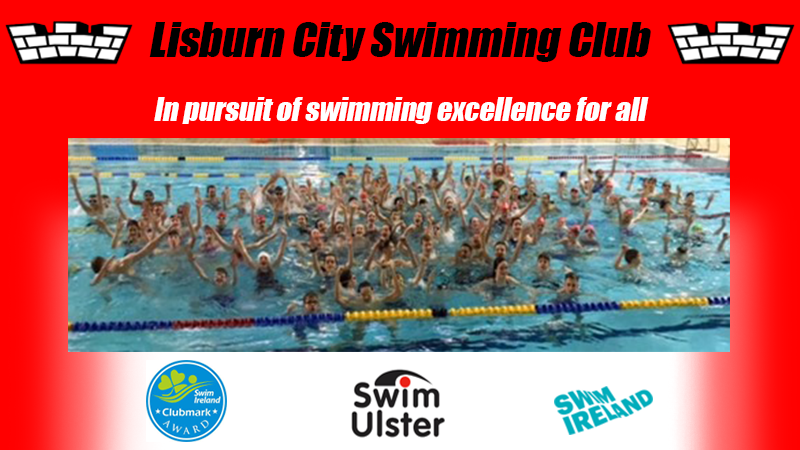 All these small things will add up and make up the future swimmers and competitive culture at Lisburn City SC, athletes that are self suﬃcient and look to their coaches for guidance and not always dictated instructions. Fantastic results from the entire team, coaches were very impressed with the swimmers sticking to instructions and executing skills from the training pool into the competitive arena. Still work to be done but great progress. Thanks to all the parents and supporters for their encouragement and buying into our vision for the swimmers. Up next is the Swim Ulster Long Course Championship over three days at the end of April, again back in the Aurora.